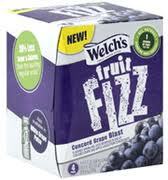 4-pack Welch's Fruit Fizz only $1.98! Yay! My kids love these drinks...they think it's soda! Bring this coupon to Walmart to get the drinks for $0.25 each.